If it isn’t quite obvious by now, I am a fan of Andrew Bird in all of his many incarnations: swing revivalist, contemplative solo artist, unlikely rock band front man. I’m a fan whether the performance is tight and flawless, or if it resembles a practice session. 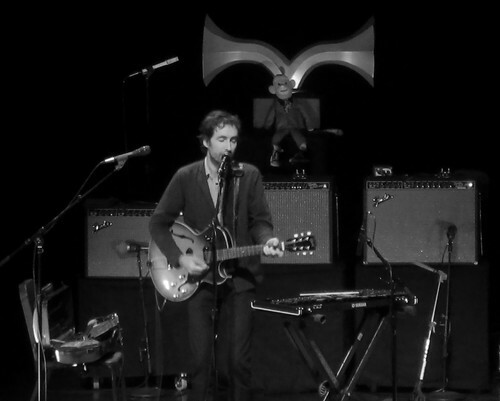 The concert at Ann Arbor’s Power Center for the Performing Arts was a little closer to the latter, with a scruffy Andrew Bird winding his way through a nearly two-hour set of both old favorites and newer compositions, some of which are still obviously unfinished. The show may have lacked a bit of polish, and his whistle may not have been as clear and crisp as usual, but as someone who has been anxious to hear what Bird has been up to in the six months since I’d last seen him, I was more than pleased. I think a slightly-less-than-perfect performance can outshine a flawless one any day; to me, those little mistakes make the show seem more human. Bird performed the show largely solo, though he was joined on a few numbers by opener Haley Bonar and guitarist Jeremy Ylvisaker. Bonar and Bird go way back, with Bonar providing backing vocals on several tracks on Armchair Apocrypha; Ylvisaker, of course, has been collaborating regularly in Bird’s current band set-up. They joined him on a beautiful version of “Spare-Ohs”, from Armchair Apocrypha, which was inspired by several events, including the death-via-foxes of his many chickens at his barn in rural Illinois. It’s a story I’ve heard tons of times, in tapes of older shows, but it’s always been one of my favorites. The new songs, however, were a main focal point of the show. Playing so many new songs could potentially be off-putting to the casual fan who mostly wants to hear his or her favorite song, but Bird went ahead and even dared to end his main set with a new song, “Danse Caribbe”. He acknowledged the unconventional setlist, thanking the audience several times for being patient enough to sit through so much new material. I am biased, of course, but I truly relish the chance to get to hear new, unreleased songs by any artist. They give a feel for what’s to come on the new album, and this show was no exception. In a recent interview with Gazelle Emami at the Huffington Post, Bird said that he was most inspired by “love, regret, [and] the pursuit of happiness” on his upcoming album, several songs of which we were (presumably) treated to in Ann Arbor. It’s a theme that shines through in the new songs he’s been trotting out. “Lazy Projector” is about selective memory, Bird explains. His voice seems nearly fragile throughout as he sings “[who is] the editor splicing your face from the scene? It’s all in the hands of the lazy projector, that forgetting, embellishing, lying machine,” and closes the song with the repeated refrain of “No, I can’t see the sense in us breaking up at all,” the ultimate expression of remembering only the good times in a relationship, at the expense of the many reasons you probably broke up in the first place. “The Lusitania”, a song which Bird has been trying out live since at least 2009, has always been a song that uses “naval history as a metaphor for relationships and the excuses we make for conflict” (and also is a little bit about electricity). “Orpheo Looks Back” presumably takes its name from the Orpheus myth, where the singer Orpheus is to retrieve his dead wife from the underworld, on the condition that he does not look back at her until they have both arrived at the upper world. “Orpheo…” is still very unfinished, with an A-section and a B-section that Bird can’t quite figure out how to piece together. “This is the real wild card of the evening,” he said while introducing the song. “I figured watching me struggle might be entertaining.” While there were definite gaps as he moved between sections, the song is still shaping up to be something lovely. Based on the new songs he’s been performing, if 2009’s Noble Beast was a slighty cryptic yet ultimately pretty badass break-up record, this forthcoming album is going to be a pretty badass look at recovery, rising from the ashes, starting over. I can’t wait to hear it. I’m really looking forward to his new album. Thank you! I’m so glad you enjoy them. 🙂 I can’t wait to see where he goes with this new album – I’m sure it’ll be fantastic, based on what we’re hearing already! This review makes me so happy for so many reasons! Yes, I definitely felt like the newer stuff was far more polished than the older stuff, except for Orpheo, which he admitted to still needing to work out some kinks. I’m guessing that maybe he’s so immersed in the new stuff because he’s working on the new album, and so the older stuff isn’t quite as close to the front of his mind? Great review! I was at that show too and, of course, really enjoyed it. You did a nice job discussing his new songs, all of which I didn’t know anything about before the show.